CAMBRIDGE, MA--(Marketwired - Jan 14, 2015) - InsideTracker, leaders in personal health analytics, today announced the launch of InnerAge™, a groundbreaking service that helps people take steps to look and feel younger while prolonging life. Unlike any service that has come before, InnerAge™ helps individuals understand, manage and optimize the unique factors within their own body that impact the way they age. 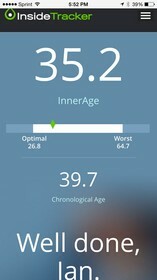 Developed over the past two years by some of the world's leading authorities on aging, nutrition and exercise physiology, InnerAge™ analyzes the blood biomarkers most scientifically proven to impact longevity to assess a person's biological/physiological age versus their chronological age. Its sophisticated algorithm then recommends five personalized "Focus Foods" with the greatest potential to optimize these biomarkers, thereby lowering a person's InnerAge™, and helping to slow the effects of aging from the inside out. InnerAge™ is not an anti-aging solution offering quick fixes or cosmetic shortcuts. Instead, it helps people make sense of the most reliable science on aging in order to make lasting changes that can be tracked over time. Following a simple blood test, the InnerAge™ intuitive dashboard provides a wealth of information on the results, as well as nutrition advice, to improve wellness goals. By following its recommendations, individuals can optimize their InnerAge™, shaving up to 15 years off their actual age. They may also catch early warning signs that could negatively impact their longevity. The team reads like the "Who's Who" of aging research, and includes among others, Professor David Sinclair of Harvard Medical School, author of 162 publications in aging research and named by TIME Magazine as one of the world's hundred most influential people, Professor Lenny Guarente of MIT's Biology Department, one of the world's leading academic researchers and author of over 200 publications in the field of metabolism and aging, and Dr. Gil Blander, founder and Chief Science Officer of InsideTracker, whose extensive postdoctoral research on aging at MIT was the genesis of InnerAge™. "A person's InnerAge™ is impacted by the decisions they make every day," says Dr. Gil Blander, Founder and Chief Science Officer of InsideTracker. "We created InnerAge™ to be an easy-to-understand platform that helps people make smart decisions based on the most advanced science available. By providing a tangible value (one's physiological age), we are giving people an immediately understandable benchmark and strong motivational force to modify their behavior to optimize their health, minimize age-related disease, and prolong life." Regardless of age, everyone has the potential to optimize their longevity, by taking simple steps to manage the biomarkers that have the greatest impact on aging. Glucose, found to have the strongest correlation to longevity, should be given special consideration. Dr. Blander explains, "Crucially, to optimize longevity, people need to manage and optimize their body's glucose, vitamin D and inflammation levels, as well as improve their liver function. InnerAge™ will fine-tune your body's performance, much like servicing your car fine-tunes your car's engine. The advice is tailored to your body, and might include guidance like eating avocados, beans, and artichokes to reduce glucose, and eating more salmon, cheese, and mushrooms to increase levels of vitamin D."
The InnerAge™ technology is protected by U.S. Pat. 8,762,167, and other pending patent applications. As the scientific knowledge on aging continues to evolve, so too will InnerAge™. The team will continue to update the algorithm and platform as new research emerges and more studies become available. Priced at $99, InnerAge™ is the latest addition to InsideTracker's portfolio of analytical plans, which range from $49 - $499 and address various wellness needs. To unlock the core data that flows within us all and to see the full menu of InsideTracker plans, visit www.insidetracker.com. Further images of InnerAge™ may be viewed here. *Included in InnerAge™ for men only.